While India is accusing Pakistan for unprovoked firing that killed two Indian soldiers, two Indian newspapers have suggested the army may have provoked recent fatal clashes in the disputed Kashmir region, says BBC News Asia. The reports say commanders breached a ceasefire accord by ordering new observation posts on the dividing Line of Control (LoC) after a 70-year-old woman crossed it unhindered last year. Although Indian government blames Pakistan for the aggression, But in a rare case of contradicting the army line, two Indian newspapers say the sudden spike in violence may instead have been provoked by its recent actions - and a grandmother deciding to join her family in Pakistani-administered Kashmir. According to The Hindu newspaper, after the 70 year-old woman managed to cross the LoC unhindered last September, alarmed Indian commanders responded by ordering new observation posts in the area - construction work that is barred under a 10-year-old ceasefire agreement between the two rivals. Pakistan reportedly made its displeasure known, at first via a tannoy system across the relatively small gap between the two sides, and then by firing. 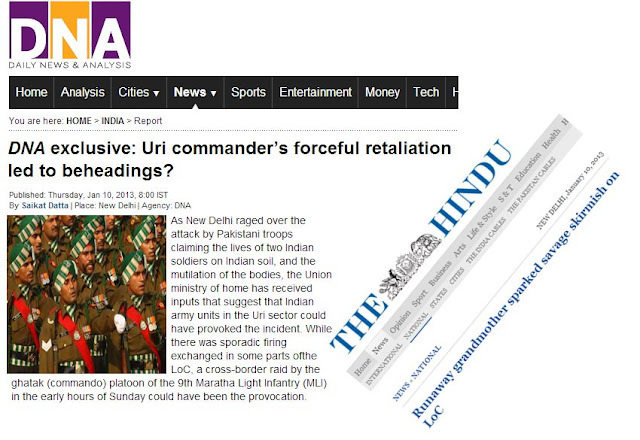 On 6 January, an Indian commander known for his "very aggressive track record", according to Daily News and Analysis (DNA), decided to counter-attack resulting in a Pakistani soldier being killed. Islamabad alleges that Indian troops also crossed the LoC in that attack - something Delhi denies. The Pakistanis then hit back with a raid across another border area on Tuesday morning, with India condemning their actions as "barbaric" and "inhuman" following reports the bodies of the two Indian soldiers who died had been mutilated.